I was in the middle of going over the price action for the day and ready to post when all of the sudden I started to noticed Bitcoin just flush. My phone started blowing up and Skype was ringing all over, clients were panicky. Yours truly here was actually stopped out as well. The reasons for this drop are a combination of technicals and some fundamentals. I had been talking about the 45-degree line being the most important line on the entire screen and it broke. Also, Bitcoin Cash was being placed on Coinbase.com. What is significant about the Coinbase.com listing of Bitcoin is that it’s the newest coin added in a while. What we saw was a series of unfortunate (or really, really fortunate) events where people exited their flat Bitcoin positions and took their capital to Bitcoin Cash. All this did was eat up some stops and we had ourselves a good ole’ waterfall. Take note of this area. I have been preaching the power and importance of Gann and his methodology towards the market. Price stopped precisely on the inner arc of the new support arc. Volume really poured in here. I was watching as price was constantly moving in the extremes from 14000 to 16000 in seconds of time. It was quite fun to observe. Price continued to advance and move higher. There was some resistance at the 16660 line, but that was mostly muted and finished. We did break through to touch the 17876 area and have been range trading between these levels now. This kind of move is healthy. This arc is proving to be a great source of resistance. However, as we continue to approach the 17876 zone and confluence of the arc, we can expect some massive move to the topside; if we do indeed move higher. Otherwise, we can see some more moves to the south. 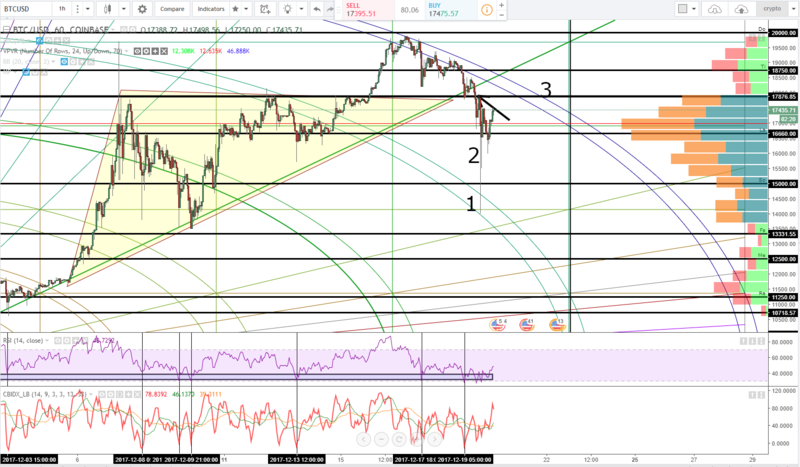 Watch for a break above the 17876 level and a break of the purple arc. This is a very bullish move if that happens.